You can get around Saint Petersburg by public transport (metro, buses, trolleybuses and trams) and by private commercial transport (buses, minibuses and taxis). The city doesn’t have a light rail system. The best way for moving is subway, the best way for paying is a travel card or a timely-limited tickets that enables payment across all types of public transport. The detailed overland transport map with key city center routes can be found at Saint Petersburg at Your Pace website. There are two kinds of buses in St. Petersburg. Public buses are operated by the city’s company, and the private ones are owned by private companies. Often they all run along the same routes. The difference here is in fare and the fact that private buses do not provide any special prices, discounts to students, disabled people, retirees etc., and the fare here is higher. The commercial buses all are marked with letter K (or T) as on photos below, for example, K-1, K-154. 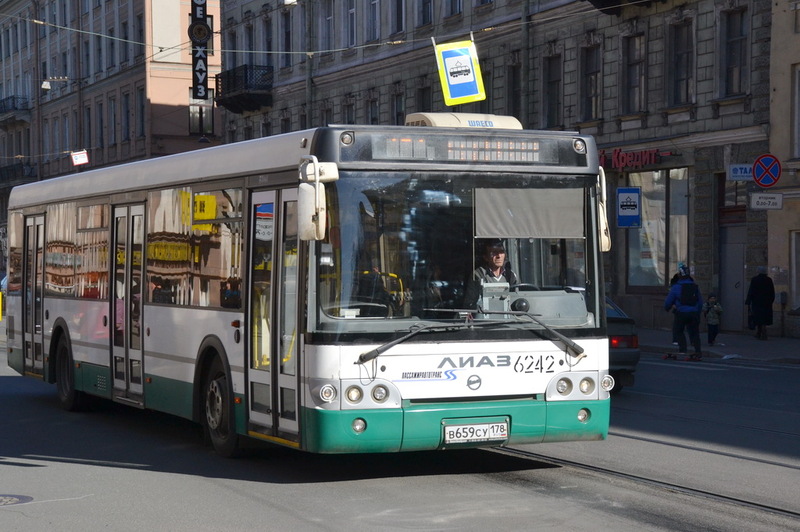 People call the commercial buses «marshrutka» (single) and «marshrutki» (plural) originative from Russian word «marshrut» (route). Unlike public kinds of transport, commercial ones can stop at any spot you want along the route, you just have to ask a driver in advance. Public buses stop only at official stops. There are two types of commercial buses: large ones and minibuses, below on the picture. The only difference between the two types of commercial buses is their size, and sometimes the small ones are a bit faster. There are also trolleybuses and trams. Most of the residents use subway and commercial buses. For subway, read our detailed guide on how to use metro in St. Petersburg. For taxi, read our post article with fares from and to some key spots in the city. How to pay. For commercial buses there are two options. 1. You pay when enter. That’s right for about 90% of all commercial routes. You can see a sign Оплата при входе (Pay when enter). The money is given to a driver. 2. You pay when exit. In this case a sign reads Оплата при выходе (Pay when exit). Public transport provides the same options. The money is given to a fare collector that sells you a ticket in the bus or the fare is collected by a driver in the front part of a bus. 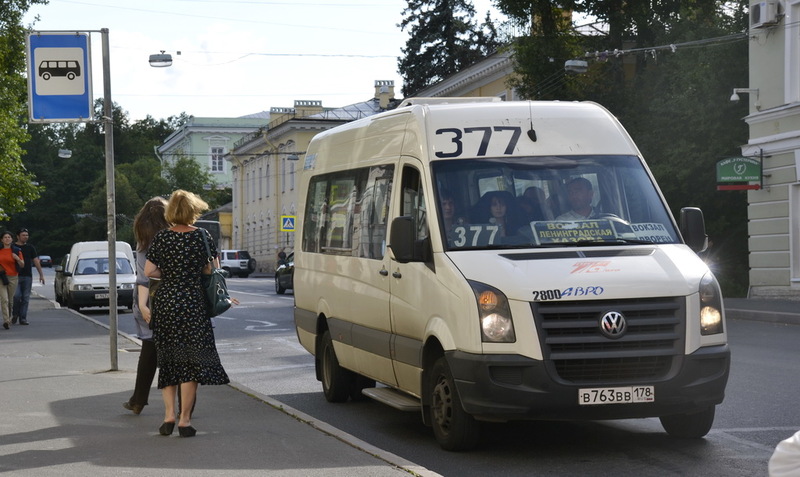 St. Petersburg’s transport system doesn’t use zone-limited tickets for a single trip or any other kind of travel within the city, such tickets are applied only for distant suburbs. The entire city is a single zone, and you pay the same amount of money, no matter how far you travel, two stops or more along the whole route. But that’s right only for one trip. When you exit one vehicle and enter another one (for a transfer), you have to pay again. — a time limited travel pass. 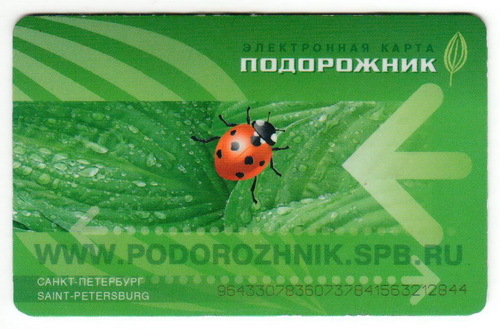 The Podorozhnik travel card (on the photo, in English ribwort) is valid both for overground transport modes and for the subway. It works as an electronic wallet: you pay for the card 60 rubles, deposit to it some money up to 15.000 rubles and pay when traveling by touching a turnstile in subway or a validator in a bus / trolleybus / tram. The card gives you discounts if you use it often. At the moment of payment you can see a card balance on a screen of a validator. The money deposited on the card is valid for three years from the time of deposit. Purchase it at ticket office at subway stations. You can deposit money both at the ticket-offices and online through payment by credit card or any e-money system or even by SMS. Travel passes for 1-7 days are available as of January 1, 2018 for unlimited travel on all public transports: bus, trolleybus, tram and subway. We did some simple calculations and concluded that if you live outside the downtown during at least two days and want to visit main sightseeings you’d better buy a travel pass for a number of days you’re going to stay for. 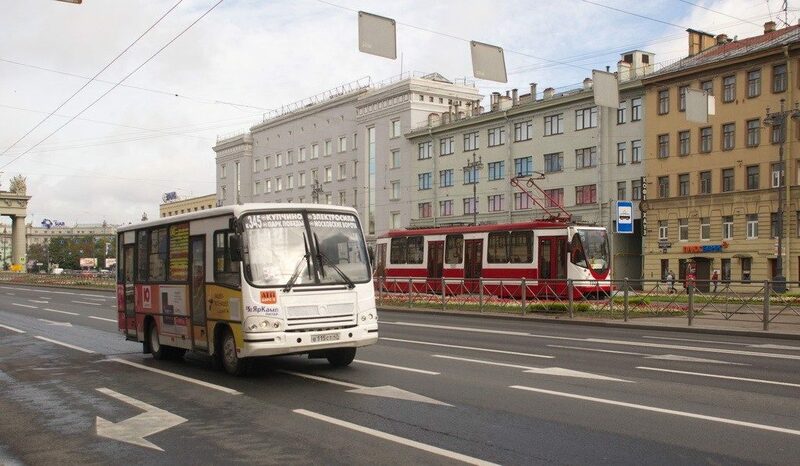 Taking into account that a single trip by subway costs 45 rubles and by bus\tram\trolleybus 40, living outside the city center means at least two trips which would cost you 80 rubles as a minimum or 72 rubles per the Podorozhnik travel card. But you are likely to take public transport also within the city center too which means one more trip, and that’s where a travel pass begins to payback. For example, four single trips by subway cost 180 rubles, and it’s just the price of a 1-day travel pass. Please, notice that the travel passes limited by time are not valid at commercial mini-buses (marshrutkas) marked with the sign K.
If you come to St. Petersburg for up to seven days and are going to visit museums, buy boat and walking tours, then it makes sense to purchase The Petersburg Card which provides a free pass to 40 museums, some tours and discounts for many entertainments. Using it only as a travel card is of no sense, only coupled with other activities. For details, visit http://www.petersburgcard.com/eng/about-card/. Bus routes to other Russian cities, towns of Leningradskaya, Pskovskaya, Novgorodskaya regions (including top destinations Novgorod, Vyborg, Ivangorod) as well as to some other countries, i. e. Estonia, Latvia, Lithuania, Finland are landed at a few spots in the city. 1. The Central Coach Station (in Russian Автовокзал or Avtovokzal). tel. : +7 812 405 75 17, +7 812 766 57 77, an inquiry office +7 812 645 14 14, daily 8:00 – 20:00, break 13:00 — 14:00. +7 812 405 75 16, +7 812 405 75 19, +7 812 766 36 44, work-days 8:00 – 16:00, break 12:00 — 13:00 (these phones don’t work on weekends and holidays). 4. Some buses depart from Baltiysky and Vitebsky railway stations. 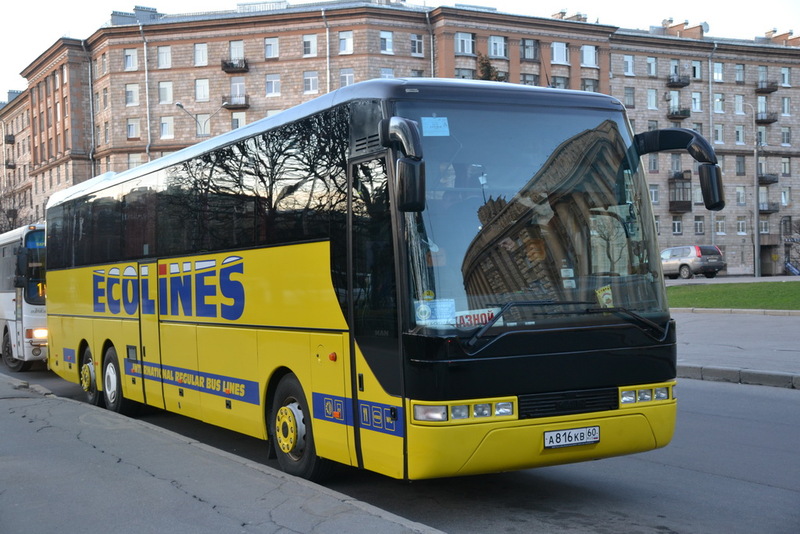 The routes to the rest of Russia and other countries are served by a few different companies including Europe-wide brands Ecolines and LuxExpress. There is no any division of destinations between the stations, it’s often the case that you can take a bus to the same town from any spot or at least two of them. The best way to get information about which bus station you need to get to your destination is to ask us, and we help. All the trains come to and depart from five railway stations: Moskovsky, Vitebsky, Ladozhsky, Baltiysky and Finlyandsky. 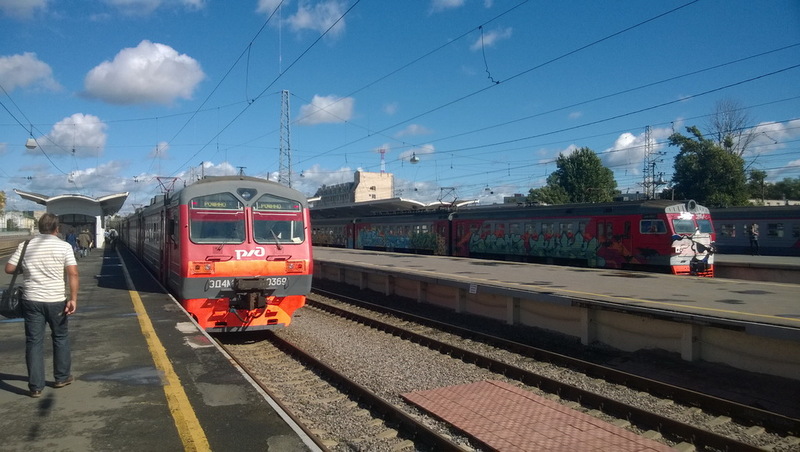 Long-distance trains are operated by Russian Railways (РЖД) and some routes by private companies. Short-distance trains are operated by North-Western suburban passenger company. For detailed information on the Petersburg’s railway stations see our post here.